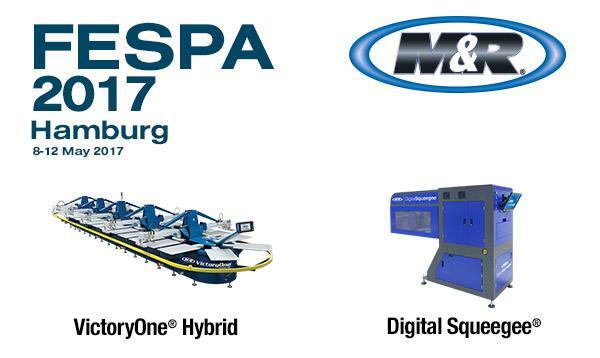 Roselle, IL, USA—The M&R Companies are pleased to announce the upcoming appearance of two of its newest products—DigitalSqueegee® and VictoryOne® Hybrid—at FESPA 2017. M&R’s Digital Squeegee® excels in high-speed short runs with many colors and demanding requirements. The printer powers 21,248 nozzles in eight industrial-strength printheads capable of firing up to 30,000 times per second. In less than five seconds, a Digital Squeegee can print a full-size 40.6 x 50.8 cm (16” x 20”) digital image in one out-and-back pass, making Digital Squeegee the industry’s fastest digital printhead—by far. Digital Squeegee, in concert with one of M&R’s i-Image CTS (computer-to-screen) imaging or imaging/exposure systems, nearly eliminates the digital portion of pre-press setup. When Digital Squeegee rips a digital art file, it sends a white underbase separation file to the i-Image where the operator can generate a screen pre-registered for Tri-Loc’s Tri-Sync Registration Pallet. At the same time, Digital Squeegee generates a CMYK file for the digital print to be stored in a folder until it’s time to run the job. Digital Squeegee can print on a wide array of fabrics, including synthetic and performance, and it’s compatible with environmentally friendly screen inks like HSA or Urethane inks and water-based digital inks. Digital Squeegee inks can be cured in conventional gas convection dryers, and it works with most newer M&R automatic screen printing presses. A preproduction model of the DigitalSqueegee was previewed at the ISS Long Beach Show in January, but the formal launch will take place at FESPA. Product details and specifications will be available at that time. M&R’s new VictoryOne® automatic oval press will arrive at FESPA with its digital printhead option. VictoryOne’s 22-station base module can be expanded in 6-station increments to create 28, 34, 40, 46, 52, 58, and 64-station configurations. All but the four stations at each end of the press can support printheads, which must be configured in opposing pairs. Otherwise, there are no restrictions on printhead placement, and any station can be left open. 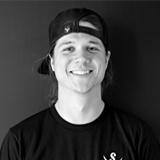 VictoryOne’s flexibility allows it to be tailored to almost any production requirement. The VictoryOne digital hybrid screen printing system allows screen printers to use the custom, on-demand printing available through digital direct-to-garment technology in combination with screen-printed effects like puff and glitter inks. It brings a new level of versatility and profitability to conventional screen printing operations by allowing those operations to take on work that can’t be done by screen printing alone—and to do it at speeds unheard of on standalone DTG printers.